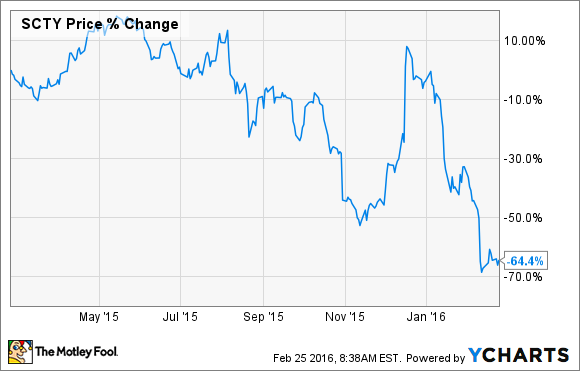 How Risky Is SunEdison's Stock? Will the sun shine again on SunEdison stock? SunEdison, (NASDAQOTH:SUNEQ) stock has been slammed over the past year. With share prices down 95% and market capitalization hovering at an unsteady $400 million, investors are wondering whether it's worth it to stick with SunEdison. Here are three risk considerations every SunEdison investor needs to know. 1. Dude, Where's My Cash? Solar investors are increasingly expecting companies to deliver not only rising revenues, but also smooth cash flow and even (gasp) profitability. SunEdison has, by and large, failed to meet these great expectations. The company doled out billions to expand its portfolio via acquisitions, with plans to use its yieldcos to keep cash coming. SunEdison's cash problems can be traced back directly to its acquisitions—the company's core business remains a contract-based model. This recurring "toll booth" revenue is the same reason investors go ape over natural gas pipelines and the steady, never-ending income they can provide. Currently, over 80% of SunEdison's contracts are for six years or longer. Since the company has decided to stop expanding at such a rapid rate, investors won't have to worry about fast-growing debt, but they will need to watch to make sure SunEdison can make good on its cash flow improvement plans. SunEdison also made clear that it does not intend to become a solar manufacturing powerhouse. Instead of continuing major investments (including capital expenditures and maintenance), the company intends to license its solar material technology to other manufacturers. This is another trick to keep SunEdison's cash under control, but it does make it more difficult for investors to understand SunEdison's upside and downside. Instead of calculating manufacturing capacity, SunEdison's valuation will depend on intellectual property costing—a notoriously hard number to nail down. And if other solar companies scoop SunEdison's technology advantages, the company will see this income source dry up. Investors need to keep an eye on how successful SunEdison is in monetizing this business model pivot. If it stops manufacturing and can't sell its technology, SunEdison is going to hit even harder times. There are many reasons why residential solar power will play an important role in the energy sector's future. But currently, there's no denying that utility-scale is simply lower-hanging solar fruit. Economies of scale and long-term financial contracts make large solar projects both affordable and dependable. Residential solar has taken off in some parts of the country, but it's a riskier investment. As SolarCity (NASDAQ:SCTY.DL) investors (myself included) have seen over the past year, expectations were simply set too high for household-level solar. Increased marketing costs and fickle state-level policy changes (like one in Nevada that essentially snubbed new solar sales overnight) have hit SolarCity's stock price hard—it's down 64% over the past year. SunEdison stock has dropped even more over the same period, despite its historic focus on utililty-scale contract projects. One reason for that may be the worry that soon-to-be-acquired Vivint Solar's (NYSE:VSLR) 523 MW of residential rooftop assets will dilute the focus and finances of SunEdison even further. While SunEdison recently renegotiated the deal to pay less for the assets and plans to immediately hand them off to its TerraForm Power (NASDAQ:TERP) yieldco, it's unclear how much SunEdison will truly be shielded from the success or failure of these rooftop systems. SunEdison has seen the light and is working hard to turn its business model around. It remains to be seen whether it can manage to do it before the sun sets. While its measly valuation screams of "buy low, sell high," investors need to know that SunEdison is still a risky solar stock investment.